Born in Southern China, painter Mian Situ received his formal art training in his native homeland of Guangdong (formerly Canton), before relocating to the West, first to Canada and then to the US. While his earlier works provide a window into a childhood spent in China’s rural countryside during the Cultural Revolution, his time in the US has also had a great influence on his art, expanding his list of subjects to include historical themes and landscapes from the American West. He received three major awards during the 2003 Masters of the American West show at the Gene Autry Museum in Los Angeles, including the Thomas Moran Memorial Award, in recognition of exceptional artistic merit. 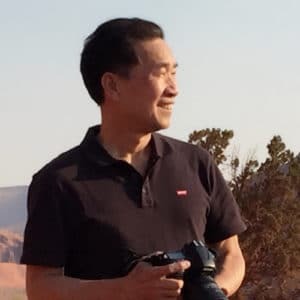 In this interview (which was conducted in Mandarin by Icey Lin, and translated by Lin and Xinle Hou), Situ discusses the differing approaches to art education in the East and the West, and how an artist’s passion for his work can affect its saleability. You received your education in China, and also taught in Guangzhou for a few years. Yes. I studied at Guangzhou Academy of Fine Arts for six years, and then taught there for six years, so I was there for 12 years in total. Your works are mainly focused on China (including Chinese immigrants) and the lifestyles of Chinese people in rural places. What significance does this topic has for you? Artists are likely to paint what they are familiar with. I moved from a village to a town when I was really little, but I still grew up in the country, so rural life is very familiar to me. It became my favorite topic to paint when I grew up. Also, I am a nostalgic person, so rural life remains very attractive to me and impacts me a lot. Even now, I am still very interested in anything that’s related to the past. In earlier interviews, you’ve mentioned that you started your painting career during the Chinese Cultural Revolution. How did that time period influence you? Before the Cultural Revolution, I actually didn’t show much interest in painting. I was doing very well in other classes, especially math. Once the Cultural Revolution started, however, all classes got suspended, the school was forced to close, and the teachers were also in trouble. I didn’t have any classes to attend, but I still needed to do something. I had a friend who was pursuing painting, and he allowed me to observe him. I found it so interesting. That’s how I started to paint. During the Cultural Revolution, there was no “normal” environment for studying art, nor did I have a teacher, let alone textbooks. I was just observing how people paint, and I imitated what they did. Most of the paintings were political propaganda—glorifying leaders or making their enemies look ugly—and I started with those subjects. After a while, I got the chance to meet more knowledgeable people, and I learned that painting was not just for propaganda. I started to read some books, even those that were difficult to find, and I learned about Western art, including the Renaissance and many different styles and genres. I became very curious and studied different Western art movements. I painted for about six years, between 1966 and 1972, before I got the chance to enter college. When I was in college, the Cultural Revolution was still going on, so they primarily taught us about propaganda, but we had really good teachers who had received a traditional education and built a solid foundation for themselves in art. They taught me in private, and passed on fundamental knowledge. That was how I captured some of the basic rules of art, even during what was a very abnormal time period. After a few years of working, I re-entered college, but then it was 1978, after the Cultural Revolution. The whole country and its ideology had changed. A lot of Western ideas about art were allowed into our education, and our teachers also encouraged us to learn from art around the world. It was then that I got to learn and understand both traditional and modern art more comprehensively. I learned about all different genres and realized that they went through a long journey of gradual evolution. From that point until I went abroad in 1987, I studied art more deeply and thoroughly. It was a very important time for me. When you first arrived in Canada, how did you balance your desire for artistic expression with your need to make a living? I never gave up. At the time I was trying to support myself, so I took jobs like creating building decorations, but I soon realized that I neither enjoyed the work nor had the capacity for it, so I quit. Then I encountered some street artists while in New York, so I starting doing that job in a Vancouver park, in an area where artists can paint tourists. I earned a very low income, but meanwhile, I kept doing my own art, painting some Chinese minority ethnic groups and peasants for some galleries. Initially, the galleries weren’t sure if these paintings would suit the market because they had never seen these subjects. At that time, there were hardly any Chinese artists in America, so my paintings were quite unfamiliar. Then I went to a gallery that was founded by a Chinese immigrant. At the time, I was still doing portraits in the park, so I brought those works to the gallery, too. Surprisingly, they sold pretty well. 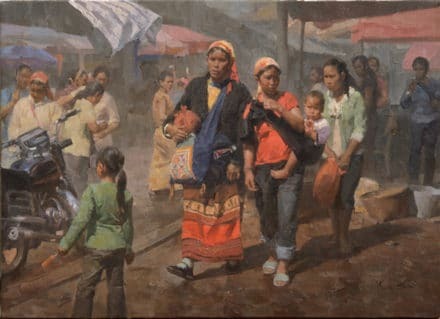 After that, I returned to painting what I love—the lives of rural Chinese people—and then I moved from Canada to the US. You mentioned that you came to the United States partly because of your longing for Western art, but when you just got here, you were disappointed by traditional American art education. Why? My needs were not met by what they were teaching in Western schools. It’s not a matter of right or wrong; it was just my personal interests. I had gone to study in US schools but gave up in the end. I found that what they were teaching me was not what I wanted to pursue. 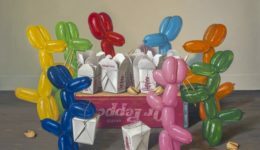 In the West, they’ve already experienced the modern art period and have transitioned to contemporary art so the art is very different from its traditional form. Ever since I start to learn painting, I have loved traditional Western art. My technique, through which I hope I can express my emotions, is grounded in conventional Western art categories. That’s what I mean when I refer to disappointment At that time, I denied that American education, but now, I think it exists for a reason, and it just happens to contradict my personal idea. Impartially speaking, I do not deny its value. Many of your paintings depict the life of Chinese immigrants in the US, including aspects that were not often recorded. What led you to visualize their experiences? One specific opportunity led me to start painting this subject. I began to sell paintings in the U.S. in 1995, but most of the art I was making then was about Chinese people in China. I also painted diverse minority groups in China. They reminded me of my own childhood experience, because their economic and cultural situation was not very modernized. They had traditional Chinese lifestyles, and their social relationships were very similar to what I had experienced in the countryside as a child. I was very interested in their culture. When I painted what I actually felt, viewers could feel the soul and the ideas that I was honestly trying to express. Then I was living in Canada, I went to a museum in L.A. and was invited to attend the Masters of the American West exhibition in 2001. John Geraghty, the person who invited me, was familiar with my earlier artwork and had collected some of my pieces. He noticed that my work was often about Chinese people in China. I had never before painted anything relating to Chinese immigrants in the US. He told me about the early Chinese immigrants who played a big part in the history of the American West. They originally came because of the gold rush and later contributed to building the railroads. The participation of Chinese laborers was very important. He told me that many artists had already painted cowboys, Indians, etc., and that I didn’t need to depict the same stuff. He suggested that I consider this topic, and I started to paint it in 2001. I still do. When we think of the Western genre, we usually think of cowboys, pioneers, or Native American people. 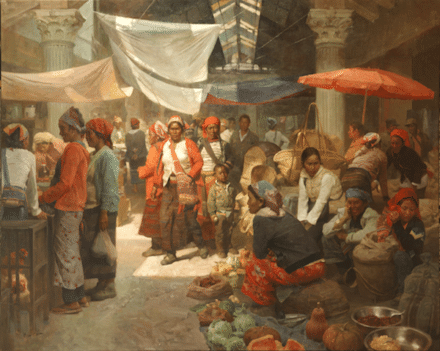 Was the subject of Chinese immigrants in US popular in this genre before you started painting? No. Before me, the Western genre didn’t include it. It was because of Geraghty’s suggestion that I started to focus on it, and afterwards people began to accept it as part of the genre. I think I have a natural advantage in depicting this subject. I am from a unique prefecture in Guangdong province—the county is called “siyi,” which literally means “four prefectures.” The majority of early Chinese immigrants in the US came from siyi, and I believe it had something to do with communication at that time; people in siyi knew about the opportunities that existed from others, so they followed them to the US. When I first visited the US, the Chinese people I met in Los Angeles’ Chinatown were speaking my native dialect, which is neither Cantonese nor Mandarin, but siyihua, the language of siyi. When I was little, I heard many stories about people from my hometown who’d gone to the US—including neighbors, relatives, and family friends. There was even a special name for my hometown: qiaoxiang, which means the home of overseas Chinese. You became a fan of Clark Hulings’ work. How did it influence you? When I moved from Canada to the US, I drove down from Toronto to Los Angeles, and I came across a museum on cowboys. There, I found Hulings’ book in the bookstore. I was not familiar with his name or his works, let alone his life experience, but I fell in love with that book. It was quite expensive for me at the time, about 100 dollars, but I bought a copy not only for me but also for some of my friends. I read more about him, and he has become one of my favorite artists of all time. A lot of painters choose to paint something that looks special and fancy—for example, beautiful women or unique figures. Hulings chose to depict the most common people, those we see in everyday life. And these common people do not live in places that are fancy or beautiful; they just live in a common environment, which is very touching to me. They live in a place that seems to be “low class,” but they still demonstrate sophisticated feelings. If we can truly capture and express this, it is of tremendous meaning. It is universal. That’s why I found Hulings’ paintings to be most touching. More and more students are obtaining an international education, growing up in one culture but studying in a different one. What advice do you have for those young people who may have a hard time defining their national or cultural identities? It’s hard to make suggestions to people in different generations—they experience a totally different path—just as I find it is difficult to give advice to my daughters. Culture, art, and technology are always changing, and the speed of change is overwhelming to my generation, making it hard to give effective advice. But there is a principle I think is important. I’ve struggled on my path. When I first went abroad, I painted many different objects and tried many genres, purely to imitate what American painters were doing in the market because I needed to make a living. I didn’t do that work out of passion, and as time passed, I saw that those works weren’t good. In the end, people bought the works that featured what I was familiar with. Collectors told me that I was demonstrating proper technique in both kinds of pieces, but when I painted as the Americans did, the art didn’t have my soul in it. When I painted what I actually felt, like the Chinese subjects, my childhood, and what I connected to through my own experience, viewers could feel the soul and the ideas that I was honestly trying to express. So I think the most important thing is to be honest—in other words, to love what you are doing. That will make you a unique artist. If you work with passion and honesty, instead of doing it just to make a living, you will have a better chance of success. What do young artists today need to succeed? A lot of painters are still unable to afford to do what they really love to do. The art market is constantly changing. What made you successful today won’t necessarily ensure your success tomorrow, because the world is changing so rapidly. They need to maintain their passion and devote themselves to what they love to do. I feel grateful that I have been able to do what I love.